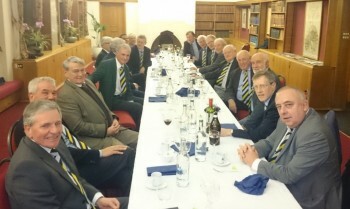 The golf season teed off with the AGM held at the school on March 18th. Numbers for the meeting were down a little on previous years but we were all well entertained by Mike Kelly’s speech after the ensuing dinner. Whitgift’s quest for the elusive Halford Hewitt trophy will have to wait another year, after a second round 3-2 defeat at the hands of Charterhouse – yes, them again. Stowe had been despatched quickly in the first round but Whitgift were unable to match the victory over Charterhouse two years ago when the sides met on the competition’s Friday afternoon. Neill Williams (OW 1986-90) and Martin Hayes (OW 1971-78) secured the top match and Alex Atkinson (OW 1991-96) and Joe Marchbank (OW 2002-09) the third, but Nic Gates (OW 1984-91) and Matt Webster (OW 1993-2001) were just squeezed out on the 18th in what ultimately proved to be the deciding match. For the lesser mortals, the first main meeting of the season saw Tony Harris (OW 1964-72) invite everyone to Effingham GC for his Captain’s Cup meeting. 20 names were in the hat and the weather was glorious. Effingham’s greens had been treated the previous week, but this clearly had no adverse effect on the eventual winner, Neil Robertson (OW 1955-61), who had travelled all the way from Lincolnshire to be with us. Both Neil and Tony himself scored 38 points, but Neil secured the victory on countback with a better last six holes. Third place was also decided on countback, with Peter Jones edging out John Butler (OW 1962-68), both on 35 points. An enjoyable day. Just to finish with an advert. We are holding a Saturday meeting this year, the first one in many years, in the hope that more people will be able to join us, especially those normally at work during the week. If you would enjoy a sociable round of golf at Croham Hurst on Saturday 11th June, and the chance to find out what the golf society is like, please come along. All standards welcome. £35 is all it takes, including the golf and a barbeque afterwards. Further details are published elsewhere in this newsletter.